Just in time for Christmas, we received a couple of puddings from the new Jamie Oliver Christmas range from Boots to taste test. 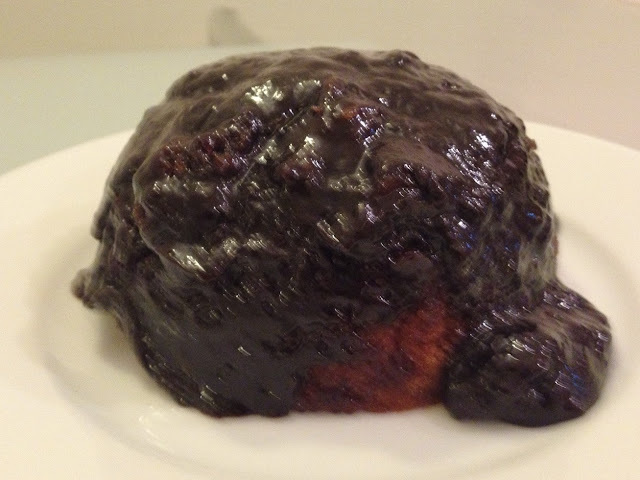 A, in particular, has a real soft spot for Christmas puddings, so we were pleased to try them out for ourselves. We got a couple of puds sent to us, and following a raucous New Year's Eve bash at A's flat with his flatmate N and some of their friends, A, C and N tucked into both as a rather late hangover cure. Happily they really worked a treat in this respect and we felt all the better for some warming pudding after spending a few hours cleaning up the debris. To make this nice and simple, we've each given the two puds "scores on the doors" out of five in three categories: taste, texture and festive appeal. Generally speaking, the three hung over testers were inclined to agree with Jamie on this one. While the jury was out on stodginess and whether we'd actually serve it up as a genuine alternative to a Christmas pudding, it would be perfect for a delicious winter dessert nonetheless. All three testers felt that this would make a great addition to any meal through the winter months. Next was the Italian style Christmas pudding, "a panettone pudding with limoncello, candied orange and almonds". 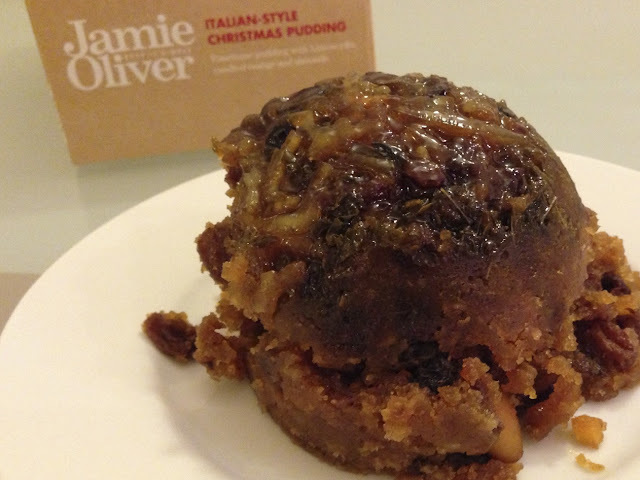 Reflecting Jamie's appreciation for Italian cuisine, it's your traditional Christmas pud with a Mediterranean twist, and packed with candied lemon, orange peel, crunchy almonds and rather a lot of booze. A and N, both fans of Christmas puddings, really appreciated this one. C was less keen, but this was no reflection on the pudding itself, but rather on her personal tastes and preference for mince pies over pud any day. Unlike the first pudding which slid effortlessly onto the plate, this didn't come out of the plastic bowl so easily, but while we didn't end up with a perfect dome, the contents were excellent and a worthy option for any table during the festive season. The texture is a pleasing mix of soft candied fruit, bread and crunchy nuts, and the booze, citrus fruits and sweet dough made for a really excellent pudding. In conclusion, the panettone pud wins out over the Christmas spiced sponge, but only just. Both puds are great choices for delicious desserts around the festive season and we'd heartily recommend both of them. Well done Jamie! If you feel like trying one of the festive puds for yourself, both are available at your local Boots store, priced at a reasonable £6. We think it's well worth indulging! Featured Content: A and C did not pay for either Christmas pudding featured in this review. 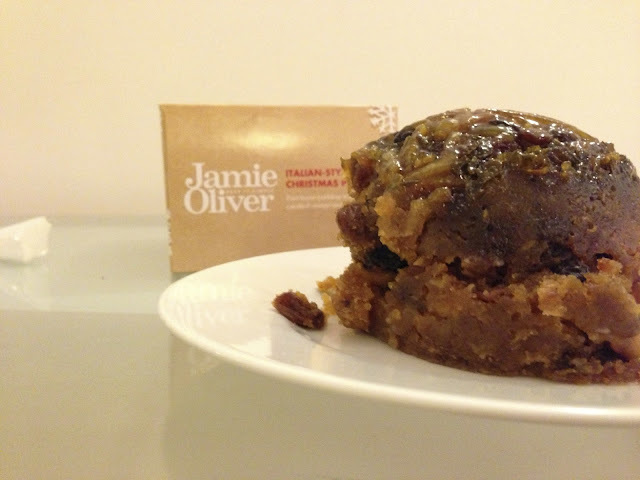 A and C enjoyed Jamie's Christmas puddings courtesy of Jamie Oliver and Red Consultancy and did not accept any additional payment for this post.